Perhaps Renoir's most famous view of Paris is this archetypical image of its newest and most fashionable district in the 1870s. The Grands Boulevards is full of the pigment daubs and bright colors that are characteristic of Impressionism. The modern life in the city is transmitted through visible strokes of paint, which operate as immediate sensory cues that allow the viewer to perceive this world as though it is passing by. This is the magic of Renoir's Paris. The world of the painting is truly historical--the modern city emerging--even though his translation of this place is a subjective and fleeting impression. While many of the greatest Impressionist paintings of the 1870s by Pierre-Auguste Renoir and his contemporaries are festive scenes of suburban or rural sociability, the city, particularly Paris, also provided a constant source of vibrant motifs. 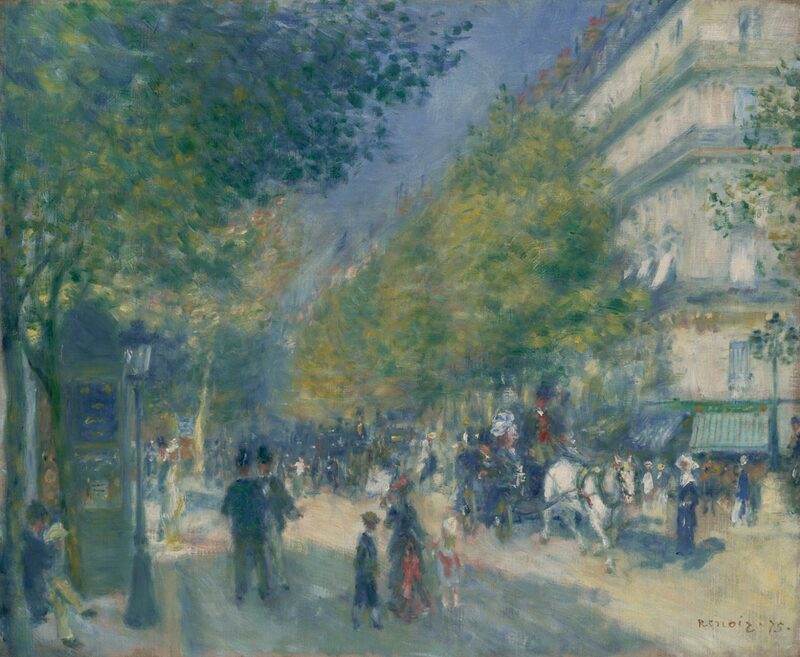 In this painting, executed the year after the first Impressionist exhibition was held in Paris, Renoir depicts one of the so-called grands boulevards cutting through the heart of the city. These broad new avenues lined with uniform--some thought monotonous--stone facades had been built in the 1850s and 1860s by the town-planner Baron Georges Eugène Haussmann, and they transformed Paris into a modern metropolis. Renoir clearly relishes the contemporary bustle, filling his canvas with traffic and commerce and lively, hurried sociability, all unified by the shimmering play of light filtering down through the treetops. Christopher Riopelle, from Philadelphia Museum of Art: Handbook of the Collections (1995), p. 196. Probably with Durand-Ruel, Paris ; Armand-François-Paul des Frisches, comte Doria (1824-1896), Paris; sale, Doria collection, Galerie Georges Petit, Paris, May 4-5, 1899, no. 208; purchased by Durand-Ruel, Paris . Collection Josse and Gaston Bernheim-Jeune, Paris . Oscar Schmitz (1861-1933), Dresden, 1900-1933 (on loan to the Kunsthaus, Zürich, 1931-?) ; his estate, 1933-1936; with Wildenstein & Co., Paris, 1936-1937 ; sold to Henry P. McIlhenny, Philadelphia, by February 1937 ; bequest to PMA, 1986. 1. Count Armand Doria purchased three paintings by Renoir from Durand-Ruel, Renoir's dealer, in July 1876, possibly including this one (he owned ten by the time of his death). See Anne Distel, Les collectionneurs des impressionistes, Paris, 1989, p. 171. 2. Per annotation in PMA copy of sale catalogue. 3. See Guy-Patrice Dauberville and Michel Dauberville, Renoir: catalogue raisonné des tableaux, pastels, dessins et aquarelles, vol. 1, 1858-1881 (Paris, 2007), no. 186. 4. "La Collection Oscar Schmitz," Paris, Wildenstein & Co., 1936, no. 51, and H. Biedermann, "Die Sammlungen Adolf Rothermundt und Oscar Schmitz in Dresden," in Die Moderne und ihre Sammler, Berlin, 2001, p. 213. Schmitz probably purchased the painting from Paul Durand-Ruel, his friend and art advisor. Schmitz loaned most of his collection, including the French works, to the Kunsthaus Zürich when he lived temporarily in Switzerland beginning in 1931 (Biedermann, p. 221). 5. See catalogue "La Collection Oscar Schmitz," Paris, Wildenstein & Co., 1936, no. 51. Georges Wildenstein purchased 62 of the French works from the Schmitz collection in 1936 (see Biedermann, p. 233, n. 46; and Daniel Wildenstein and Yves Stavridès, Marchands d'art, Paris, 1999, p. 87). 6. McIlhenny mentions the recent acquisition of the painting in a letter to Paul Rosenberg dated February 2, 1937 (curatorial file).